So, How to play 4K content on Apple TV 4 when the newest Apple TV 4 won’t support 4K streaming? Many have discussed the Apple TV 4K streaming issue by describing it as something that lacks internet support and content investment. But think about the new codecs like HEVC and H.265, and think about iPhone 6s supporting 4K video shooting and edit. Theoretically speaking, Apple is capable enough to boost the 4K ecosystem, but it anyhow stops at the threshold of Apple TV 4K streaming. Why? It is Apple’s marketing strategy. To watch 4K videos on Apple TV 4 would be as easy as rolling a log with 5KPlayer. There are many ways to achieve Apple TV 4K streaming, and 5Kplayer for both Mac (EI Captain)/Windows (10) provides the most stable approach of all. The another method is that you can use Top 4K Video Converter for Apple TV 4. Method One: How to AirPlay 4K Content to Apple TV 4 from Windows/Mac with 5KPlayer? 5KPlayer supports playing and downloading 8K/4K videos from hundreds of online websites. It empowers your Windows PC and Mac to directly stream UHD content to Apple TV 4 as smooth as cream. AirPlay iPhone 6S/ 6S Plus, AirPlay Netflix, AirPlay on Windows 8/10, AirPlay TV Shows, there’s almost nothing that 5KPlayer AirPlay cannot handle. 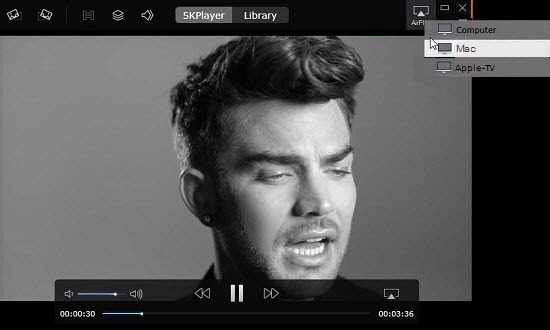 Step 1: Free Download AirPlay Sender –5KPlayer (Windows Ver.) on your PC, or Mac Ver. on your Mac. Step 3: Click the AirPlay button on the top right corner of the main interface to view AirPlay 4K video receivers. Note: Check if your Mac/PC and Apple TV connect the same WIFI network. Step 4: Click Apple TV and you’ll see the 4K video playing on the big HDTV. Note: AirPlay has limitations on file format, so make certain that the 4K contnets are in MOV, M4V, MP4. 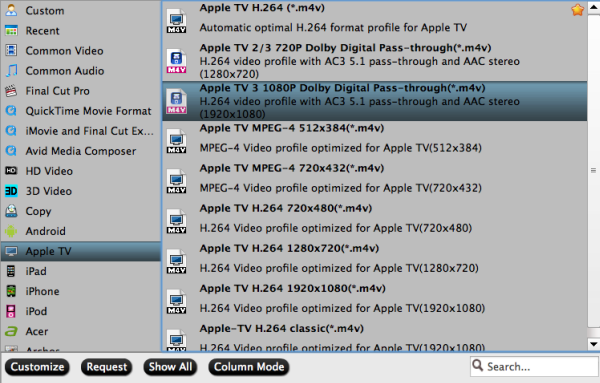 Method Two: How to Encode/Compress 4K videos for Apple TV 4 easier playback? It can convert a Blu-ray, DVD and video file to virtually any format including the lateast H.265 MP4. It can transcode some HEVC H.265 video in MKV, MP4, Prores to H.264 or other video formats like converting H.265 to AVI, WMV, MKV, MP3, WMA, M4A, FLAC, etc for various uses. 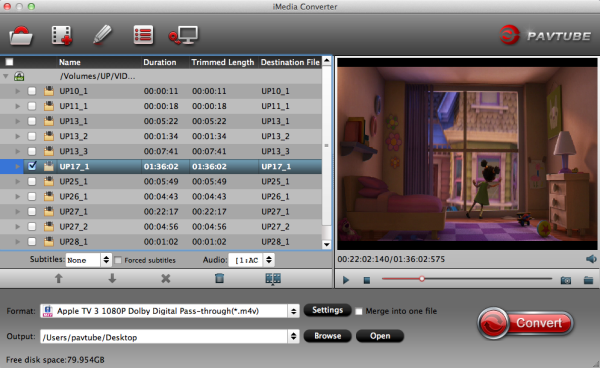 You can also edit video file before conversion. So if you want to get started and convert your video files to H.265 or convert H.265 video to other formats for Apple TV4 but don’t have any idea where to begin, we are here to help you. Furthermore, it is also equipped with advanced editing function like add subtitles, effect, text or picture watermark to 4K Video files, crop 4K Video black bars, trim or merge 4K Video files, compress output file size and etc. Just read further to know what things you can do to successfully do H.265 encoding and decoding for for Apple TV4 on Mac. Install and launch the 4K H.265 to Apple TV 4 Converter on your Mac, and then click “Add video” button to browse to 4K H.265 footage or directly drag the 4K H.265 video to the program. You can also load Internet torrents movies to Apple TV4. Click “Format” bar and turn to the Apple TV category. The program has a number of presets for Apple TV, Apple TV 2, and Apple TV 3rd Generation, to export a Apple TV 4/3 1080p video with ac3 5.1 pass-through for AV receiver decoding, “Apple TV 3 Dolby Digital Pass-through (*.m4v)” preset is recommended. Note: By choosing this format, you will get two sound tracks in the result M4V video, one is stereo, and the other is AC3 encoded Dolby Digital 5.1 pass-through. When your Apple TV 4 is connected to audio receiver, the 5.1 surround sound will work. When ATV4 is connected to your HDTV only, the stereo track will work. Learn>> how to set up Apple TV 4. Click “Settings” button; you can adjust video and audio settings, including codec, aspect ratio, bit rate, frame rate, sample rate, and audio channel. To downsacle 4K to 1080p, do remember adjusting video size to 1920*1080. If you want to downsize 4k to 2k, you are advised to set video size as 2048×1080. After everything is OK, simply click the big “Start conversion” button to start converting 4K videos for Apple TV 4. Once the conversion finished, you can easily transfer the converted 4K files to Apple TV 4 for playing anytime you want.